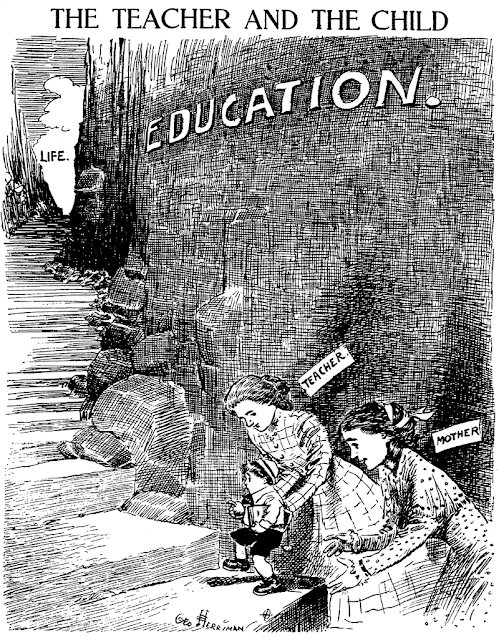 December 23, 1908 -- Two days before Christmas, and I'll bet that George drew this nice cartoon up well in advance to give him a little time off to go shopping. This is the type of material they call "evergreen" in the newspaper business, because it can be run at any time. It is common for editors to have a drawer full of this sort of material at hand for when deadlines are looning and big hunk of whitespace is staring at them. 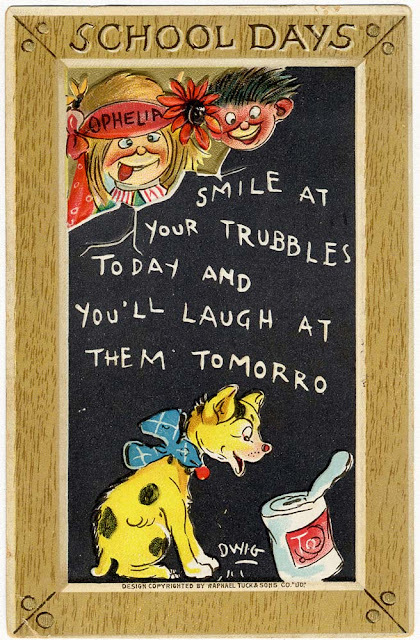 Here's another postcard from the Raphael Tuck School Days Series (#170) by Dwig. These are embossed cards with divided backs. William Paul Pim was born in Freeport, Pennsylvania, on December 1, 1885, according to Alabama Authors, BhamWiki and other sources. However, Who Was Who in America with World Notables, Volume 3, (1960) said Pim was born near Freeport, and Who’s Who in American Art, Volume 1 (1935) said his birthplace was in Armstrong County. The 1900 U.S. Federal Census recorded Pim as the oldest of two children. Who Was Who said their parents were Ira Lester Pim and Mary Ella Dougherty. The family lived in Butler, Pennsylvania. 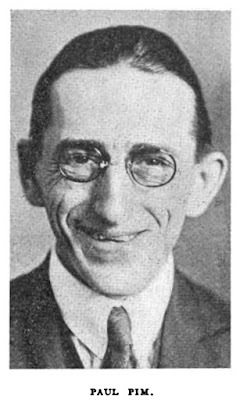 Who Was Who said Pim graduated from Cabot (Pennsylvania) Institute in 1903, and studied photo-engraving Bissell College in Effingham, Illinois in 1906. Pim’s residence in the 1910 census was Cleveland, Ohio at 1854 East 18th Street. His occupation was commercial artist. Who Was Who said Pim had a studio in Cleveland until 1914. 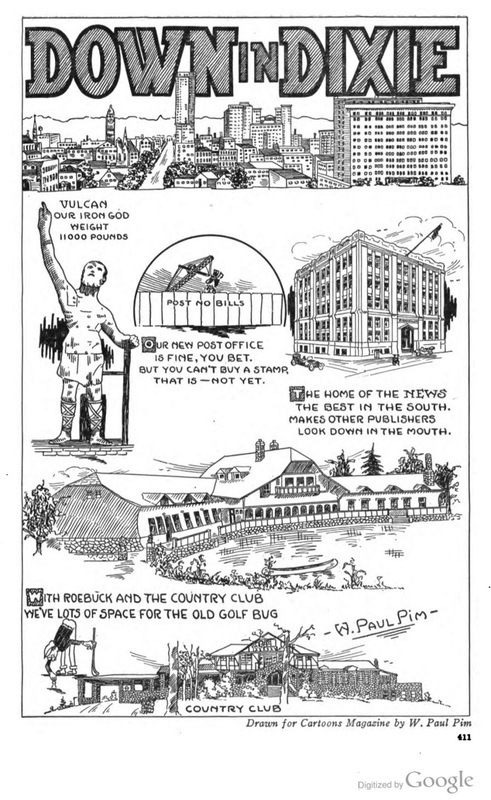 From 1915 to 1917, Pim resided in Birmingham, Alabama, where he was a cartoonist for the Birmingham News. He married Lenna E. Hales on July 16, 1917 in Birmingham. 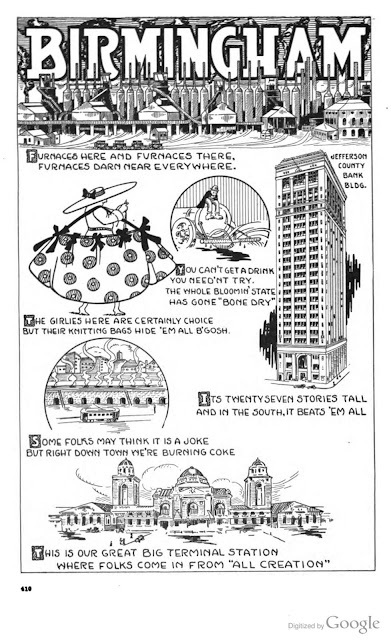 Cartoons Magazine, October 1917 reported their skyscraper wedding. 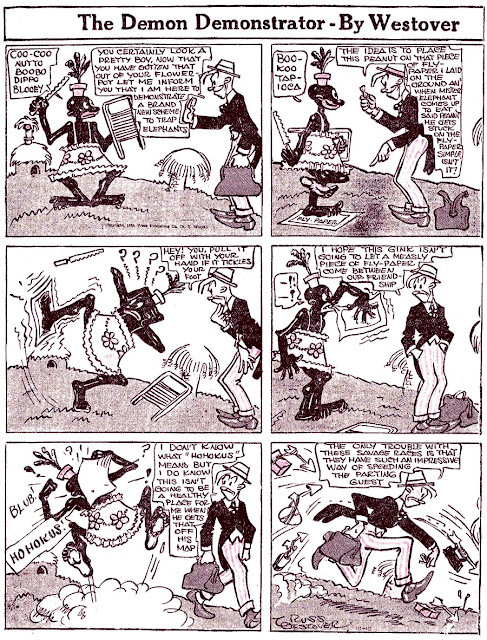 Cartoons Magazine, February 1918, also noted Pim’s marriage. Who Was Who said Pim was with the Cleveland Plain Dealer from 1917 to 1918. While in Cleveland, he took the life class of John Huntington at Polytechnic Institute. On September 12, 1918, Pim signed his World War I draft card which had his address as 130 North 73 Street, Birmingham, Alabama. He was an artist with the Birmingham News and described as medium height and build with gray eyes and brown hair. Pim moved from the News to the Birmingham Ledger from 1919 to 1920. During the 1920s and 1930s, American Newspaper Comics (2012) said Pim produced Baby Mine, Masterpieces of Great Literature, Telling Tommy, and Next! The 1930 census recorded Pim in Birmingham at 4300 9th Court. In 1939, Pim wrote Telling Tommy About Mother Nature’s Curious Children, the first of seven Telling Tommy books: Telling Tommy About Famous People in Their Youth (1940); Telling Tommy About Days We Celebrate (1941); Telling Tommy about Famous Inventors (1942); Telling Tommy About Our Good Neighbors (1943); Telling Tommy about Things We Use (1946); and Telling Tommy About Pilgrims Progress (1957). 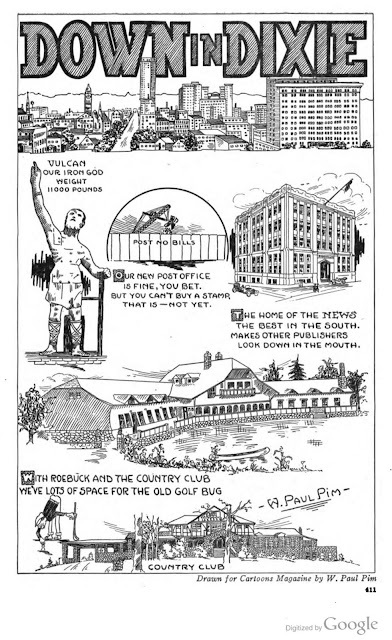 According to the 1940 census, self-employed artist and writer Pim was a Birmingham homeowner at 4300 10th Avenue. Pim passed away July 26, 1950, in Birmingham. Many newspapers published the Associated Press obituary. Pim was laid to rest in Forest Hill Cemetery. 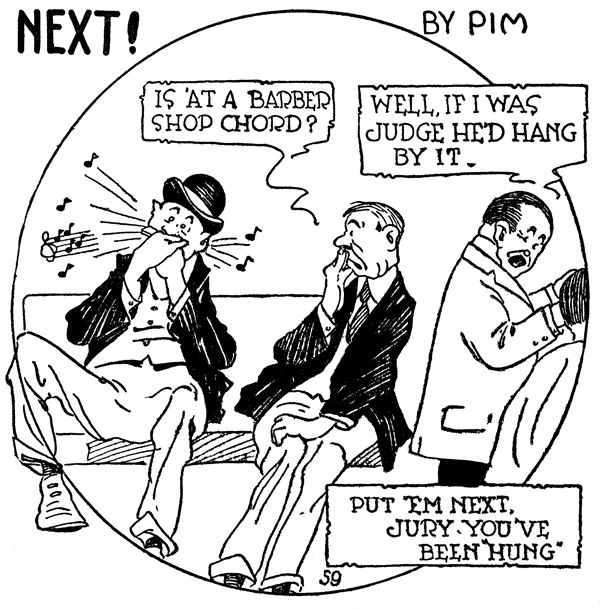 Obscurity of the Day: Next! Some cartooning fans are fascinated by the question of who is the worst (successful) newspaper cartoonist of all time. I think a pretty solid nomination for that title should belong to William Paul Pim. He is a patently awful cartoonist (the samples above should be all the proof you need), yet he worked at several major newspapers, and sold two successful long-running features to major syndicates. What his employers saw in him I can't imagine, and why newspapers bought and ran his syndicated offering is a mystery, too. More power to you, though, Mr. Pim, you are the living embodiment of the Peter Principle. 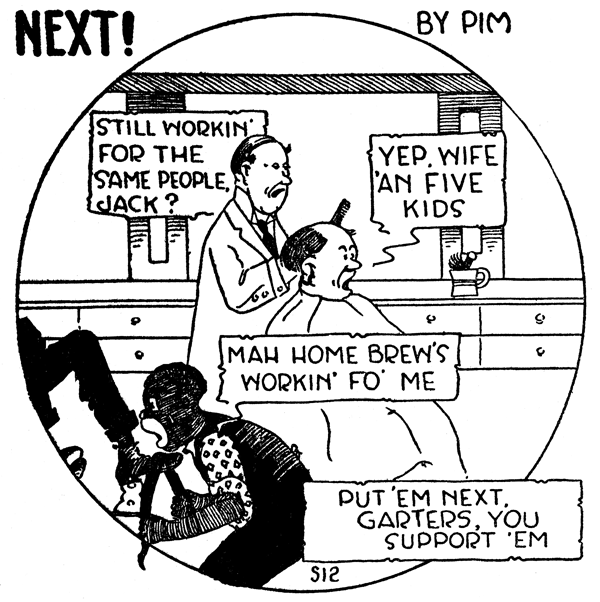 Today's obscurity, a panel Pim produced for a short while titled Next!, is a mystery of several different sorts. 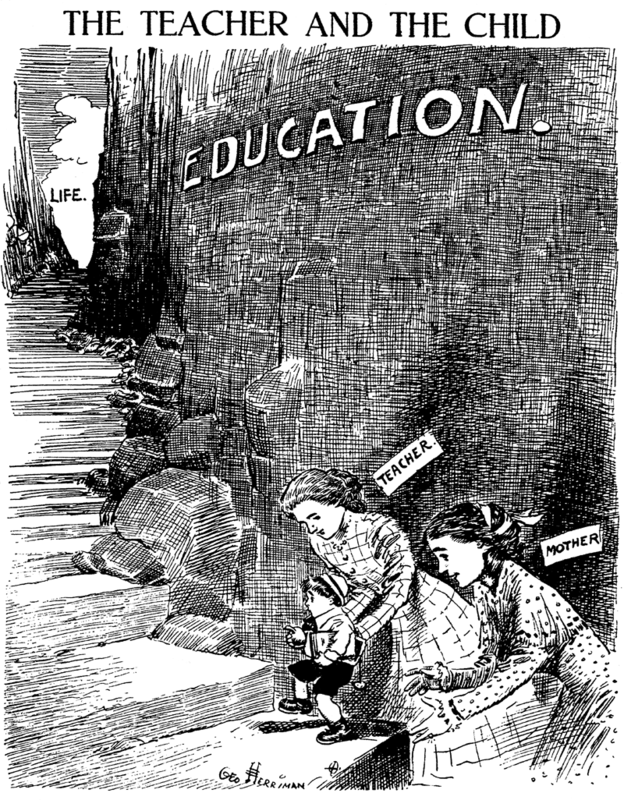 The drawing is, of course, awful, but it is the gags that fascinate me. Many of Next's gags go right over my head and would be right at home on the Comics I Don't Understand blog. Or do the gags just not make much sense, and it's not me? Geez, I dunno. I get the main gags in the bottom two, but every one of those "Put 'Em Next" lines may as well be written in Sanskrit for all I get out of 'em. A lot of it is obviously intended to be wordplay, but it's utterly opaque to me. Next! was a regular feature of World Color Printing's weekly black and white page from at least 1926 through 1933. I see lots of panels repeating over those years, so Pim apparently didn't actually create all that many of these, and WCP just recycled and re-recycled. It is my guess that Next! does not originate on those WCP weekly pages, though. My guess is that they were produced for some other syndicate or newspaper earlier on, and re-sold to WCP. I have no documentary proof of that, but it's just my Spidey Sense tingling. Does anyone know if they actually originated elsewhere? Okay, I can figure out the last two jokes, though they're not especially funny. The others baffle me. 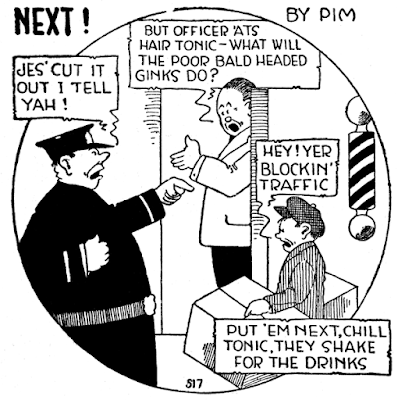 Is the one with the policeman a Prohibition gag (cop thinks the boxes are full of hooch)? The "Put 'em next" blocks are simple puns, unrelated to the main gag. But what the heck does "Put 'em next" mean anyway? Russell “Russ” Channing Westover was born in Los Angeles, California, on August 3, 1886, according to his World War I and II draft cards. (Currently, the birth and death dates at Wikipedia are incorrect.) The American National Biography Online said Westover’s parents were Canadian-born Channing Clisson Westover, a haberdasher, and California native Alice Aldrich. RootsWeb said the couple married July 5, 1894 but the year is incorrect, most likely a typo, and probably occurred in 1884. The 1895 Oakland city directory said Channing Westover, of C. Westover & Co., resided at 664 18th. Westover’s father passed away December 10, 1895 as noted in the San Francisco Call, December 12. Westover—In Oakland, December 10, 1855 [sic], Channing Westover, a native of Vermont [sic], aged 44 years 6 months and 17 days. Westover, his mother and siblings were named in the December 25, 1895 edition of the Call which reported the will. The 1900 U.S. Federal Census recorded the Westovers in Oakland at 568 Twelfth Street. The Canton Repository (Ohio), July 29, 1928, said Westover attended the public schools of Oakland then studied art, for five months, at the Mark Hopkins Art Institute of the University of California. In 1904 Westover was a sports artist at the San Francisco Bulletin. He went on to work for the Oakland Herald and other San Francisco papers, including the Chronicle, and the Post. 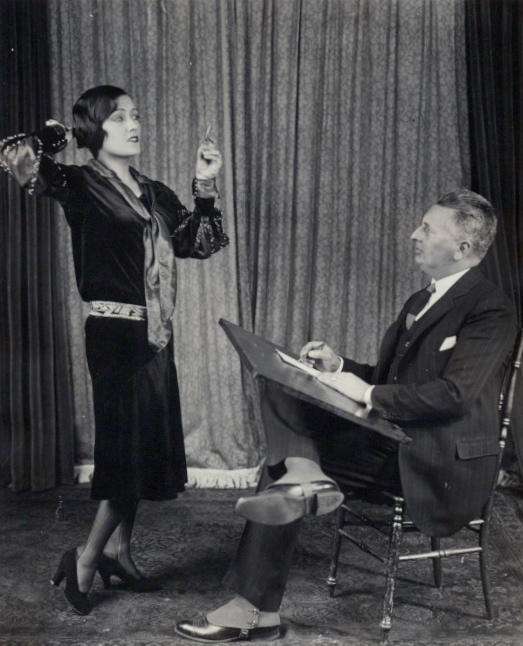 The 1906 Oakland directory listed Westover, an artist, and his mother at 940 Chestnut. According to American Newspaper Comics (2012), when Bud Fisher left the Chronicle, Westover continued Fisher’s strip A. Mutt from December 11, 1907 to June 7, 1908. 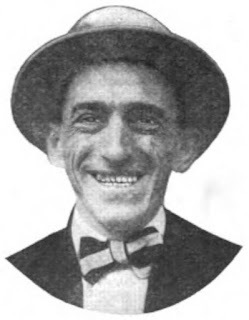 Westover’s next Chronicle comics were Jonathan Nofan, from June 10 to 14, 1908 and Sporting Celebrities When They Grow Old, from August 20 to October 5, 1908. The California, Marriage Records at Ancestry.com said Westover married Genesta G. De Lancey on August 2, 1908. The 1909 Oakland directory said the couple resided at 881 38th. In the 1910 census, their address was 877 Milton Street in Oakland. The same address for Westover appeared in directories from 1911 to 1914. American National Biography Onlline said Westover moved to New York City in 1913. For the New York Herald, Westover produced Fat Chance (1914), Snapshot Bill (1914–1918) and Looie and His Tin Lizzie (1917–1918). Westover drew Romantic Raymond (1919–1920) for the New York Evening Telegram, and The Demon Demonstrator (1920–1921) for Press Publishing. 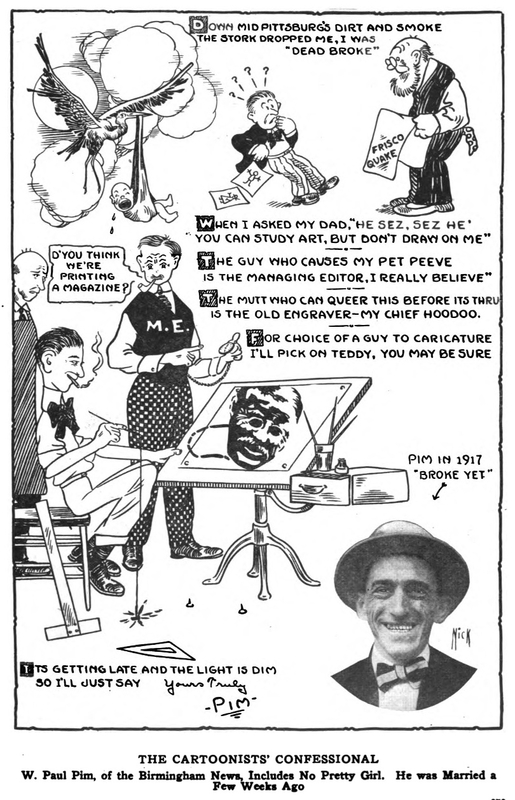 When Westover signed his World War I draft card on June 5, 1917, he resided in Harrington Park, New Jersey, and was a New York Herald cartoonist. The description said Westover was of medium height and build with blue eyes and dark brown hair. Greenwich, Connecticut was Westover’s home, on Sound Beach Avenue, in the 1920 census. The cartoonist had two sons, Russell and Alden. In the 1930 census Westover’s new home was in New Rochelle, New York at 168 Wellington Avenue. This address was recorded in the 1940 census and on his World War II draft card. On March 16, 1960, Westover returned to Los Angeles from a trip to London. His address was 215 Seaview, San Rafael, California. Westover passed away March 5, 1966, in San Rafael. He was laid to rest at Mountain View Cemetery. Here's a real one-note strip from the pen of Russ Westover, The Demon Demonstrator. Funny enough but awfully repetitive. Salesman shows off his wares, demo backfires. What really saved the strip was Westover's snappy dialogue, which livened up the proceedings quite a bit and kept New York World readers from getting bored with the same old, same old. 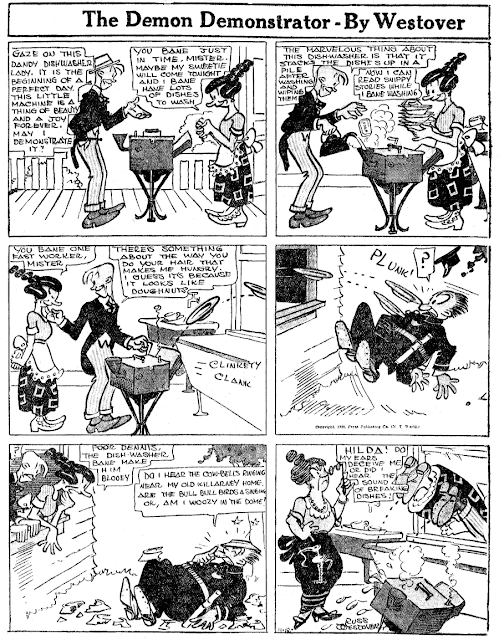 The strip ran on an inside page of the Sunday funnies section in quarter-page format from June 13 1920 to February 6 1921. It was right at this time that Westover jumped ship to the Hearst camp and introduced his new daily, Tillie the Toiler, which would prove so popular that a Sunday would be added the next year. 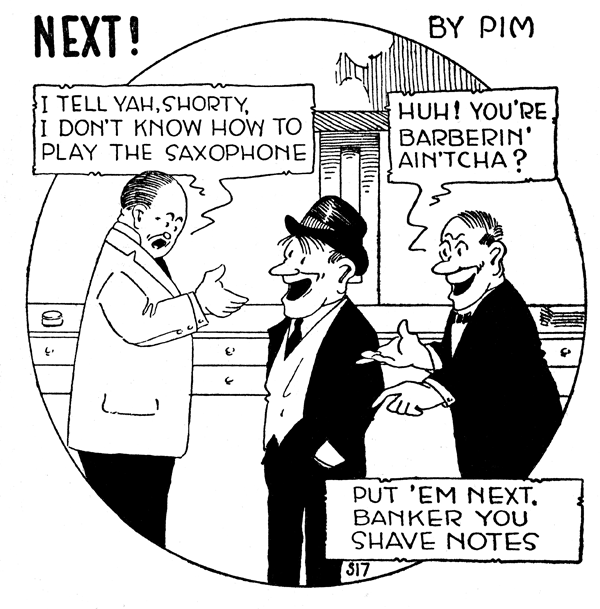 I'm sure it's some forgotten joke from 100 years ago, but why does the woman in the first strip keep saying "bane"? She's an immigrant -- probably Dutch, Norwegian or some such -- and (according to the humorists of the time) they say 'bane' a lot in place of 'have','are', or 'am'. So for instance "I bane going to the market" is either "I am going to the market" or "I have been to the market". In the 50s, reading and hearing old old jokes, I got the impression that "bane" was somehow derived from Scandinavian languages, mostly Swedish. If we looked into it, I bet we'd find bane as a verb form in Swedish. "Bane" was how Scandinavians pronounced "been" in old dialect comedies, along with pronouncing j's as y's. True fact: Wallace Beery played "Swede", a stereotypical Swedish domestic, in silent comedies. Definitely Swedish. The Swede, though not so apparent today, was once a large segment of the immigrants to our shores, and, like any incoming nationality, was caricatured into the into the popular culture venues like movies, comic strips (remember "Yens Yensen, Yanitor" or "Phyllis"?) and vaudeville. The dialect was well established long before talkies, though by then the Swedish wave of immigrants had died down. Philadelphian El Brendel made a career out of playing the dumb Swede with that dialect. Beery's early comedy character in drag was named "Sweedie", a rather imposing scrub woman/laundry worker/kitchen help, sort of like a real life Powerful Katrinka. A comic-book Swede who way outlasted the immigration trends was Olaf of the Blackhawks. As I recall he said "ban" rather than "bane." And, of course, "Yumpin' Yiminy." This being the Christmas season I must also salute "Yogi Yorgesson" (Harry Skarbo), who hit the Top 10 in 1949 with "I Yust Go Nuts at Christmas," a very funny song, dialect or no dialect.